The Bayonne Bridge is the third longest steel arch bridge in the world, and was the longest in the world at the time of its completion. It connects Bayonne, New Jersey with Staten Island, New York, spanning the Kill Van Kull. The bridge was designed by master bridge-builder Othmar Ammann and the architect Cass Gilbert. It was built by the Port of New York Authority and opened on November 15, 1931. The primary purpose of the bridge was to allow vehicle traffic from Staten Island to reach Manhattan via the Holland Tunnel. Ammann, the master bridge builder and chief architect of the Port Authority, chose the steel arch design after rejecting a cantilever and suspension design as expensive and impractical for the site. 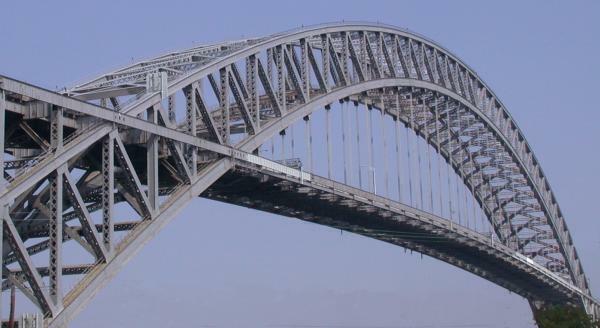 The eventual design of the bridge called for a graceful arch that soars 226 feet (69 m) above the Kill Van Kull and supports a road bed for 1,675 feet (511 m) without intermediary piers. The total length of the bridge is 8,640 feet (2,633 m) with a mid-span clearance above the water of 150 feet (46 m). The arch resembles a parabola, but is made up of 40 linear segments. The design of the steel arch is based on the Hell Gate Bridge designed by Ammann’s mentor, Gustav Lindenthal. Gilbert had designed an ornamental granite sheathing over the steelwork as part of the original proposal, but as in the case of the George Washington Bridge, the stone sheathing was eliminated in order to lower the cost of the bridge, leaving the steel trusses exposed. Construction on the bridge began in 1928, and eventually cost $13 million. 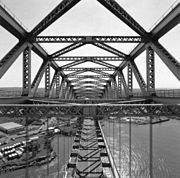 When it opened it 1931, it was the longest steel arch bridge in the world. It was deliberately built seven meters longer than the Sydney Harbour Bridge, which opened the year after. The presence of the Bayonne Bridge ultimately led to the discontinuation of the Bergen Point Ferry. The supported roadway carries two lanes of traffic in each direction. The roadway deck could accommodate an expansion for either two traffic lanes or two light-rail lanes. A pedestrian walkway, cantilevered from the western side of the roadway, currently provides the only access by foot to Staten Island. The Port Authority also permits bicycle traffic, however the sidewalk ends abruptly at descending stairs on the New Jersey side. Due to safety concerns, bicycle riders are required to walk their bicycles across the bridge. Tolls are collected on vehicles traveling into Staten Island (there is no toll for vehicles traveling into New Jersey). The car toll is $8.00, though discounts are available for Easy pass riders. Blog at least 8 facts you gleaned (got) from the above article. ~ by stufffromthelab on July 30, 2008.